…and dozens of other potential variations. Well, when a new user registers to use the IDX search on your website, they may or may not bookmark the actual IDX search page. Which means that every time they want to log into their account, they either have to type in the page address that hosts your IDX search, or click on the Search page from your site’s navigation menu. Nothing overly complicated, but still, I can see where some people might find it a slight inconvenience. 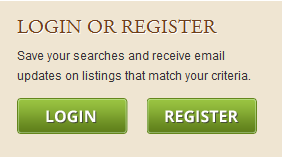 So, in today’s post, we cover a quick an easy way to display a “Log-in or Register” Call To Action on your home page. All you have to do to prompt the log-in page for your IDX map search is append the following to the end of the URL where you’re hosting your IDX map search: /#ShowLogin. So if you’re URL is: johndoerealestate.com – you would add #ShowLogin to the end of the URL like this: johndoerealestate.com/#ShowLogin. Similar to creating a Log-in page, in order to create an Account Registration page, all you have to do is append the following to the end of the URL where you’re hosting your IDX map search: /#ShowRegister. So if you’re URL is: johndoerealestate.com – you would add #ShowLogin to the end of the URL like this: johndoerealestate.com/#ShowRegister. 1.) Link to it from your sidebar. This way, it’s prominently placed on your various blog posts and interior pages of your site. It serves as a Call To Action to new users to create an account and it’s an easy access page for existing IDX users. 2.) Link to it on the header of your site. When I go to a website, and I want to find a company’s phone number, my eyes always go to the upper right-hand side of the site. It’s prominent real estate space and for the most part, I know I can always access the phone number there. So why not create an easy way for existing (and new) IDX visitors to log-in or create an account as well. Really, you can link to those new log-in and registration URL’s from anywhere – including them in your email signature is one idea. How else might this be useful? 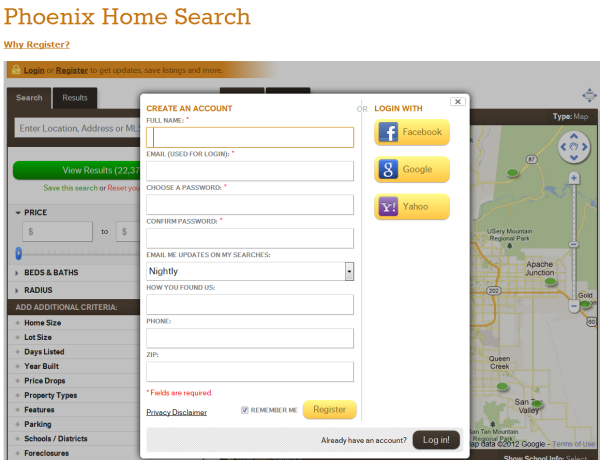 Do you currently provide an easy way for site visitors to log-in or create an account on your IDX search page? I had been looking for a similar solution before and happy to see this awesome addition. Does this work with dsWordPress IDX? Sorry, but no as dsIDXpress does not have a registration feature. This has always been a great option, especially when linking from a home page or other page where you don’t have dsSearchAgent. However, having it visible on a page where you have dsSearchAgent (like in the header) can cause problems. Here’s why: Let’s say the user is already searching dsSearchAgent and now wants to save a search or favorite listing. If the user then clicks one of the links you created with the #ShowLogin or #ShowRegister tags, dsSearchAgent will reload, and the user will lose the search or listing that they are viewing. What would be awesome is if DS included in the dsSearchAgent script, a floating Login / Register tab that we could place on the top or side of our sites, which would properly bring up the Login or Register screen without causing the user to lose their place! I agree with Tina – it would be GREAT if this was a module. The only problem with the way that it’s presented here is that the buttons will still display even after a user logs in or registers, which is confusing. When a user logs in to dsSearchAgent, the program creates a cookie that remembers who that user is – it would be uber-simple for you guys to provide some coding that your more advanced users could use to create a real, working login/register button instead of the workaround mentioned here, or a module that we could include on our sites.